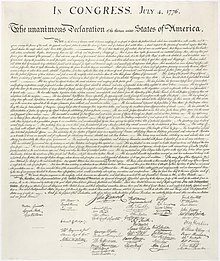 The Declaration o Unthirldom is the statement adoptit bi the Seicont Continental Congress meetin at the Pennsylvanie State Hoose (Unthirldom Haw) in Philadelphia on Julie 4, 1776, which annoonced that the thirteen American colonies, then at war wi the Kinrick o Great Breetain, regairdit themsels as thirteen newly independent sovereign states, an na langer unner Breetish rule. Instead thay formed a new naition—the Unitit States o Americae. John Adams wis a leader in pushin for unthirldom, which wis passed on Julie 2 wi na opposin vote cast. ↑ The thirteen colonies war: Delaware, Pennsylvanie, New Jersey, Georgie, Connecticut, Massachusetts Bay, Maryland, Sooth Carolina, New Hampshire, Virginie, New York, North Carolina, an Rhode Island an Providence Plantations. Massachusetts, Rhode Island, Connecticut an New Jersey war formed bi mergers o previous colonies. This page wis last eeditit on 22 Februar 2017, at 04:38.